These chunky water-soluble ink blocks bring a new sense of freedom and colour to your drawing and painting! This year we have extended the colour range to 72 colours, which compliment the Inktense pencil range opening up an exciting world of possibilities. Our innovative Inktense Blocks open up a world of vibrant tones, pure ink-like colour and permanent marks. Dry Derwent Inktense delivers pure vibrant colour but when completely washed out it is transformed into a translucent ink-like paint which, when dry, can be worked over. They are perfect for large expressive pieces, splashes and loose marks, yet they also make the ideal companion for watercolour artists who like to work directly with a brush on all sizes of artwork. You can use them like pans of paint, apply colour directly to wet or dry paper and use them on their side to cover large areas quickly. Become dazzled by the vibrancy of the colours, seduced by the smooth translucent pigment, and motivated by their sheer versatility. They can also be used on fabric to create stunning silk paintings and quilts. 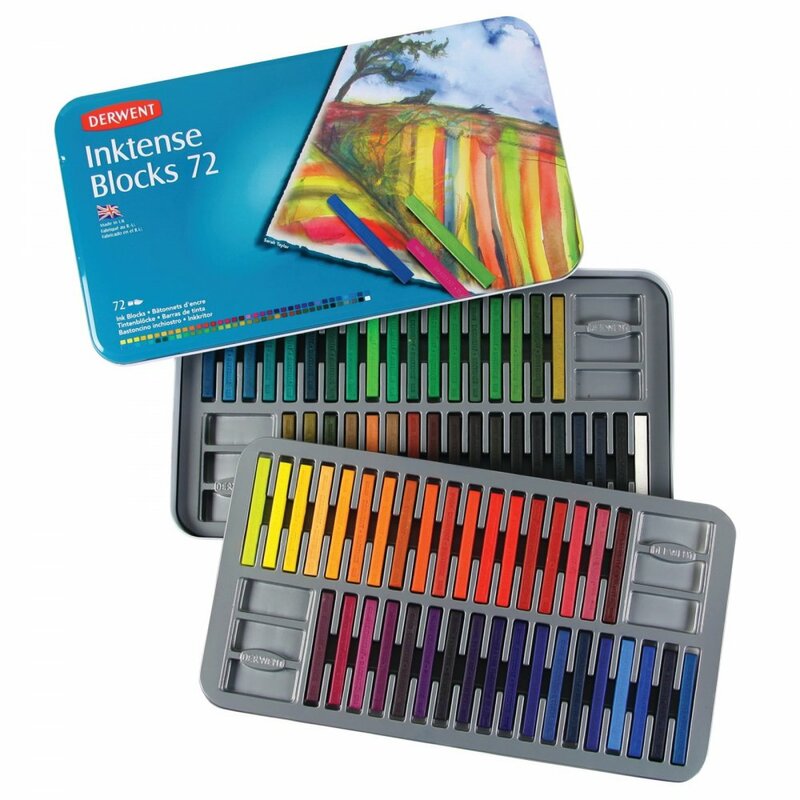 Showing 2 Derwent Inktense Blocks - 72 Tin**^ reviews. Average rating of Excellent. Would you like to write a review? A glorious range of colours that can be mixed and blended in the 72 Inktense Block tin. They may appear expensive, but a little goes a very long way, so they last for ages. Well worth the money. These are so easy to use and create such intense colours once water/fabric medium added. I love the ease with which you can mix and blend the colours helping you create great patterns. Once dry you're able to add even more colours over the top without disturbing the first layer. Fantastic product.